Bob, at race finish with crew Marc Griffin and Christian Dahlhausen. We have two great CAT reports to read from recent race finishes. 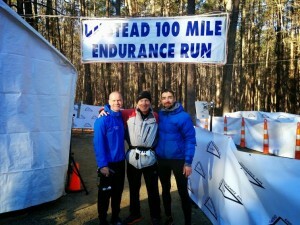 The first is Bob Clouston’s report from the Umstead 100 mile Endurance Run. Bob finished his first 100-miler in a little over 26 hours, and aside from a down period during loop 6, had an amazingly strong race. You can read his race report here. The second report is from Jen Lebendig, who finished her first Terrapin Mountain 1/2 marathon week before last. Arrive at Camping Gap, see Horton again. Wtf kind of “hike” is this mountain? Did I say, “Thank God I have poles”? Most fun I’ve had in a LONG time. Looks like comments didn’t make it over from the old website. I just wanted to repeat that I neither “owned” Umstead nor did I have an amazingly strong race. It was more of a typical first 100, where Bad Things caused me to miss my 24 hour goal by a lot, but I am proud of staying with it and finishing.